Betty Grable’s iconic swimsuit shot. After spending a relaxing day yesterday watching a couple of my favourite classic movies I decided I would start a new segment to my blog featuring some of my favourite pinup/vintage/burlesque related movies as well as ones I’ve not seen before, in the form of a short review. I hoping to share with you some great films that if you haven’t seen already, that you’ll hopefully watch too (or again) and be inspired like they’ve inspired me. I promise to have no spoilers within these unless stated otherwise! 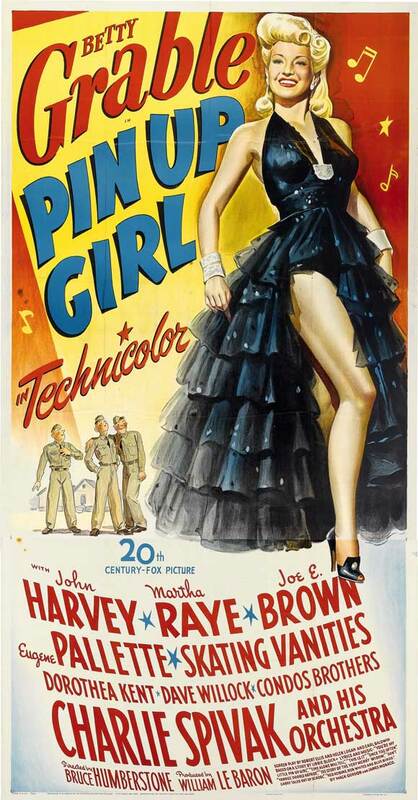 For my first review I’ve chosen the romantic comedy musical Pin Up Girl (1944) starring Betty Grable, John Harvey, Martha Raye, and Joe E. Brown. This film was based upon a short story titled Imagine this, which was written by Libby Block in 1942. The film builds upon Betty’s very iconic pinup look, and her popularity throughout World War II, including her very famous swimsuit photograph. In this film Betty plays a character named Lorry Jones, a hostess at a local USO canteen, where she performs (sining and dancing) and signs her pinup photos for the soldiers who adore her so, and who often ask for her hand in marriage. Lorry and her friend Kay Pritchett played by Dorothea Kent, take new jobs as stenographers in Washington DC, but Lorry insisted on telling the soldiers they’re going on a USO tour, singing to troupes around the country. On the way to their new jobs they decide take a detour to New You City where Lorry’s white lies continue, and take them on quite the adventure where they meet the navy hero Tommy Dooley played by the handsome John Harvey. 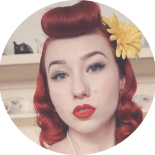 This films is the epitome of vintage glamour, the introduction includes an array of beautiful pinups with perfectly styled victory rolls, and each lady having a different unique style. 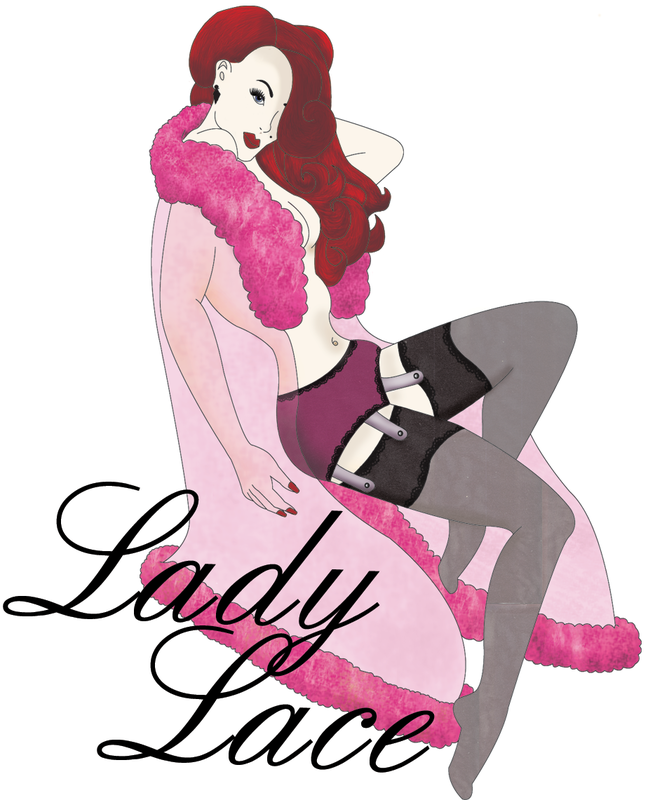 If you’ve not seen this, or haven’t seen it in a while I definitely could not endorse this anymore, its truly inspiring for any lover of vintage glamour and pinups. 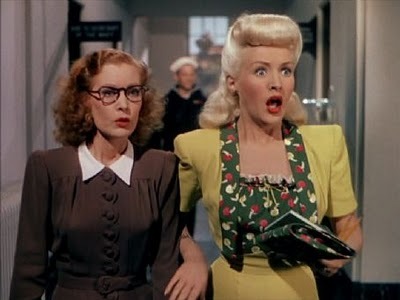 Above all, my favourite part of this movie is Betty Grable, she possesses so much confidence and glamour, her character shines above all others with all her charisma, and her talent for singing and dancing is sublime! This entry was posted on June 9, 2013 by Miss Lady Lace in Pinup and tagged 1940's, 1950's, betty grabe, john harvey, pin up girl, pin up girl (1944), pinup, pinup film, pinup girl, pinup movie, pinup star, pinups, retro, retro film, retro movie, technicolour, vintage film, vintage glamour, vintage hair, vintage lifestyle, vintage movie, vintage pinup, world war II, world war II pinups.